N8876 N Sechlerville Road Hixton, WI. | MLS# 1521749 | Clearview Realty in Hatfield Wisconsin. Helping Hunters, Families, and ATV'ers list or buy property for 15 years. Serving both Wisconsin & Minnesota. 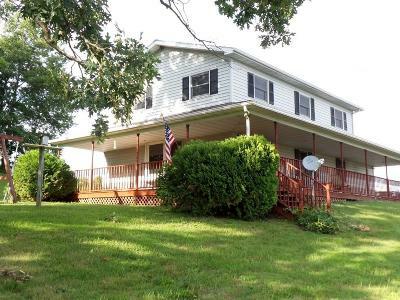 4BD, 1.5BA hobby farm on 10 acres. Spacious mudroom, laundry room & half bath as soon as you walk in. Nicely upgraded kitchen w/ walk-in pantry & breakfast bar; formal dining, living and family room with sliding doors to the wrap around covered deck. All bdrms are upstairs with a full bath. 50x90 pole building with water, horse stalls & fenced pastures. 32x45 insulated 4 car garage/workshop with in-floor heat & overhead hoist. Blacktop driveway; apple, pear & cherry trees.